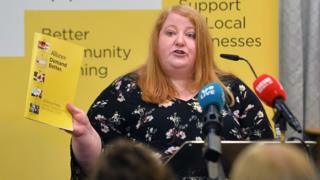 Alliance leader Naomi Long has urged voters to "break the cycle" of orange and green politics in Northern Ireland in next month's council elections. She was speaking at the launch of the party's local government election manifesto in Belfast. She also said Alliance was committed to ensuring openness and transparency for ratepayers. The party is running 84 candidates in a bid to win seats across Northern Ireland's 11 councils. In 2014, they secured 32 seats. This is Naomi Long's third election in charge of the party since taking over in 2016. She said she recognised that the party faces a challenge in reaching electoral success outside of Belfast. "It is a chicken and egg situation," Mrs Long said. "People say: 'I would vote Alliance, if only Alliance were on the council already', but if people don't vote Alliance, we'll never break that cycle." Alliance has five key pledges, including increasing regeneration powers, promoting openness and transparency and opposing Brexit. Mrs Long suggested there needed to be an escape route from circular debate about Brexit, and said the only solution was another referendum.